Nearly a quarter of Kuwait’s entire population is under the age of 14 and yet with the exception of school assemblies, we never hear their voices. During Ramadan, Kuwait Times likes to publish a special series that engages with its readership in a more direct, personal way to learn their concerns, issues and viewpoints. This Ramadan, we will chat with some of our youngest readers about their lives in Kuwait, in an attempt to see the world through their eyes. What do they see for the future of our beautiful country? What would they improve and how would they change it? By listening to their future plans, stories, and experience in Ramadan, we can remind ourselves and hopefully our readers of the ties that bind us all together as a species. These are the voice of Kuwait’s future and we invite them to share their thoughts with us here. 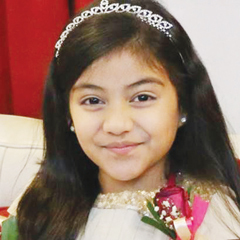 Zainab Khairallah is an 8-year-old girl studying in the American Academy of Kuwait. Kuwait Times: What do you know about Ramadan? Zainab: Ramadan is a holy month when Muslims fast. I pray and give donations during the holy month to become a better Muslim. KT: What are your favorite toys? Zainab: Instead of playing with toys, I enjoy watching tutorials of hairstyling, makeup and cooking shows on YouTube. I want to be a master in everything I love! KT: What do you love about Kuwait? Zainab: Kuwait is my home, I was born here and I love this country. KT: Do you have pets? Zainab: No, I do not want a pet now. Maybe later when I grow up, I can have one. KT: What do you hate about Kuwait? Zainab: I hate the hot weather. But the only way to fight it is to be at home all the time and play. KT: When not in school, what do you do? Zainab: I love to eat, so I want to learn how to make food for myself. KT: What place would you like to visit? Zainab: I want to visit the Philippines. The climate and people there are just amazing! I am fond of greenery and nature. I also love their tradition. KT: How do you help in the house chores? Zainab: I help our housemaids’ set the table, arrange the living room and help by taking care of the youngest member in the family. KT: What do you do in your spare time or school break? Zainab: When I am at home, I watch TV, but also play with my siblings and read books. I also visit some relatives and sometimes go out with my parents to different places. KT: What place you love the most in Kuwait? Zainab: The Scientific Center’s aquarium. I like watching sharks and different species of fish. I love to swim and slide at the pool at Aqua Park. I also love the Entertainment City and places for kids in Kuwait. I also enjoy the company of people I love the most: my family and friends. KT: What do you like about Ramadan? Zainab: Fasting, praying and reading the Holy Quran and the variety of food in iftar and suhoor. Those are the things I like about Ramadan.